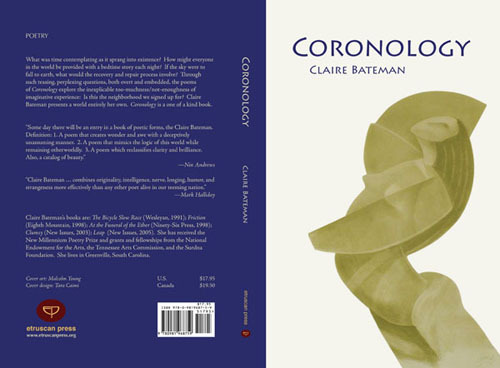 Coronology is my final design for Etruscan Press this season, and we were lucky enough to secure permission to use one of Malcolm Young’s drawings for the cover. I think it’s an enormously powerful image and was ecstatic to have permission to work with it. It’s such a pleasure to have been exposed to the works of various talented artists for my work with Etruscan. Design is nothing without powerful imagery, and I think this cover design illustrates that fact. Below is the final, full-color image. More information about author, Claire Bateman is available on her page at the Etruscan Press website, as are reviews of the book, which is available for purchase on Amazon. Great impact. Lithos is a perfect choice with the image.